Most mountaineers can hardly resist to the charm of snowy mountains, so serene at first glance but in fact so very dangerous to a person with no mountaineering knowledge and experiance. Accompanied by a mountain guide the mountains will be accessible to you safely in winter time also. 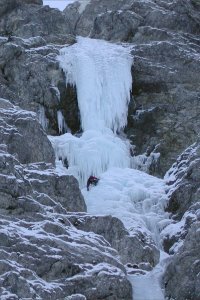 Maybe a winter ascent to a difficult summit, ascent across the steep couloir, or you can test yourself in frozen waterfall. Beside guiding I can also lend some winter equipment (crampons, climbing ice axe).